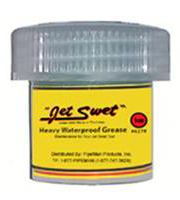 This 1oz tub of Jet Swet Grease is the same waterproof, marine-grade grease used in producing Jet Swet tools. As maintenance, it is recommended to lubricate under the compression nut after each use with this grease. This 1 oz. tub has enough for a several plus applications.